🗣 No downloads. No installation. No complex administration! With the rise of virtual instructor led training (VILT) and distance learning programs in both the corporate and education space, more and more organizations have been searching for the perfect tool that enables them to deliver effective face-to-face instruction online. It being 2018, the available options are pretty paltry. You have your legacy softwares in traditional video conferencing platforms that peddle expensive, already obsolete hardware and require everyone to download 3rd party software to the first web based platforms built with *gulp* Flash (Yikes! Been there done that). No thank you. Leading innovative virtual classroom, webinar and meeting platforms are now starting to offer fully collaborative solutions that are 100% web based — that’s important! Not sure why? Checkout this shortlist of 4 advantages of cloud based platforms over those traditional systems that require software downloads. Schools that provide thousands of computers for their students know this just like IT departments in top enterprises know this. Downloading software to your computer can expose your computer to malicious software that poses security risks to your entire organization. That’s why most of us on our organizations’ computers are not allowed to download anything without a lengthy red tap process to vet 3rd party software. Let’s say your organization proceeds with a 3rd party video conferencing software after extensive vetting. That only solves the download security issue for your internal video conference calls. Every session you plan with your global partners and customers means you are asking them to download something to their own devices which may not be possible. Forcing your participants in a webinar, virtual classroom or meeting to download and install a 3rd party plugin is a point of friction that may result in delayed starting times or some people being unable to join. With web based platforms, no one has to download or install anything. They just click a link to join. Now some of your participants will surely be connecting from their own devices, but unless they are particularly on top of their schedule they will not install anything ahead of time. They don’t expect that they have to install anything. They didn’t understand that there are additional requirements in order to participate in a conversation, meeting, lesson with you. So, at the turn of the hour when your class or meeting is supposed to start, your participants will click a link expecting to join a live session with you. Instead, they are taken to a landing page for a video conferencing platform and are prompted to install something. In the best case scenario their system supports minimum requirements and your session starts late because each participant had to download a client and figure out how to join your session from a new software. In the worst case, they’re out of luck or are relegated to a traditional phone line. Calling in over the phone is not the same as a face-to-face, collaborative session online. With web based platforms, your participants just click a link to join, so your sessions start on time for everyone. Downloading is a huge point of friction for your participants and it’s a cumbersome process that strikes fear into those that are not so tech-savvy. With so many factors to consider — operating systems, devices, versions, disk space, etc — it becomes apparent that forcing your participants to download and install something on their computers becomes a roadblock to joining your session. Companies providing platforms are always working to improve their service. They optimize functions, improve security, make the design more approachable, and build new features. For any software you download on your computer, you have to manage continuous updates in order to get the latest version. Failure to update your local copy of the software means you or your participants miss out on these advancements or you and your participants have different experiences which makes supporting them difficult. Sometimes, users putting off updates may find that they even have to uninstall then reinstall certain 3rd party plugins just to join a live session. With web based platforms, updates are automatic and available immediately as they are released eliminating the need to update one more thing. At the end of the day, you are trying to have a conversation with a group of people in different locations. These days, getting people together in one room — virtual or not — is hard enough. Anything you can do to minimize the friction around getting everyone together is a win for everyone. 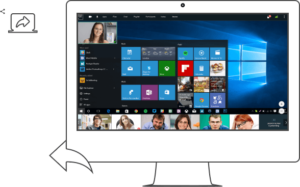 Web based video collaboration solutions are just that, solutions that address the friction around downloading 3rd party software.